The San Francisco Media Archive presents Home Movie Day – San Francisco in conjunction with the 9th Annual Worldwide Home Movie Day celebration. 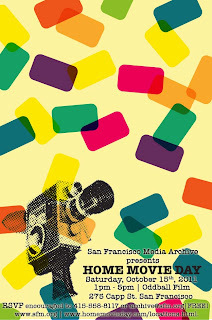 Members of the public are invited to submit their 8mm, Super 8 and 16mm home movies to SFMA by October 12th where they will be inspected by HMD projectionists and shared with an enthusiastic audience in a day-long celebration of amateur filmmaking and home movie preservation. As a special bonus, qualified films donated to the archive will be transferred free of charge and digital copies given to donors at a later date. Throughout the day there will be a rare opportunity to view unique amateur and industrial films from the SFMA collection including Welcome San Francisco Movie Makers (Dr. Frank S. Zach, 1960), Kodachrome for Consumer Use (ca. 1950), Blackie the Wonder Horse (1936) and much more! Plus - Around the World, Around the World! – a journey from San Francisco to Katmandu and back in glorious Kodachrome. Drop in for and hour or stay all day ... it’s sure to be a delightful afternoon! Admission: FREE!!! (Donations to SFMA will be accepted). RSVPs encouraged to: 415-558-8117 or info(at)oddballfilm.com . Submissions: Submissions are being accepted at SFMA from Monday to Friday 1-5pm until October 12th. No submissions necessary to attend. 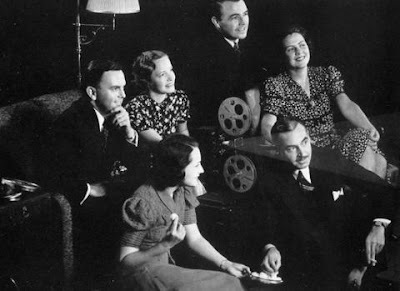 Click here to learn more about Home Movie Day .